(video) Big Questions 2: What Has God Written on the Wall? This world is filled with Big Questions. People who know their God can understand the Big Questions, like Daniel could read the Writing on the Wall: “Mene Mene Tekel Upharsin.” God wrote two books. Both books give the same message, both together answer all of the Big Questions of life. –How can we know God? If the Bible is a self-revelation of God to man, what does he say about himself through the Bible? Why do some people hate the God of the Bible, and others adore him? We will investigate in this video series thematic lines running through the Bible. We will learn to highlight the amazing continuity of these 10 ideas God is conveying to us. Since the goal of reading the Bible is knowing God and since this is why he gave us a book, knowing who he is and his purpose and plan for the world is foundational. 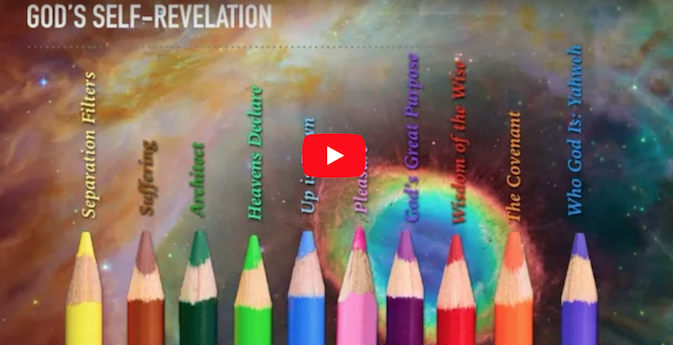 This second video introduces the Big Questions in light of God’s 10 strand “rainbow-scaffold” of self-revelation in the Bible. SUBSCRIBE to my Youtube channel today. Don’t miss any episodes.